Nice color and image. The lettering catches your eyes immediately. Good work! I love this pic because it’s more modern. I love the fact this artist chose the neon color and keep it the colors bright because it catches my eye. What is also amazing about this art I like how the traffics is moving fast and the guy in the picture looks like “he is the matrix.” Like he is stuck in between reality and fantasy. 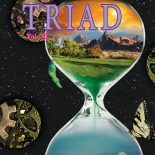 This entry was posted on November 19, 2012 by hcctriadme in Cover.